Don’t forget! Pep Club t-shirts are now on sale for pre-order during all lunches. The cost is $10.00. See one of the officers during your lunch to order and/or pay. The Love is Love Club is selling Ally Pins during all three lunches. Show your support for love for only $1. Homecoming Court nominations will begin on Monday, during all three lunches. Do you want to meet new people? How about play cards? And better yet, learn a new activity that will interest colleges? If you answered yes to any or all of these questions, consider joining Bridge Club this year. Stop by our first meeting on Monday, October 2nd, in room 408 to learn a bit about the club and the game. No experience is necessary, just a desire to learn and have fun. Juniors and Seniors: The University of Virginia and Longwood University will be here on Monday, Oct. 2. Today is the last day to sign up to receive a pass. Sign up using the link on the LHS website. Lit Mag will meet on Tuesday, October 3, in 103. See Mrs. Bahl-Moore for information. Learn how to become an effective communicator and a strong public speaker, and join the Lafayette Forensics Team! It’s open to ALL STUDENTS – no experience is necessary. Come to our informational meeting next Wednesday, October 4, after school in the Black Box Theatre, room 623. Please see Mrs. McCorry with any questions. Do you love reading? Then join the library’s book club! The first book we will be reading is The Princess Bride. If you are interested, please sign up in the Media Center by Wednesday, October 4th. New Pep Club t-shirts are now on sale for pre-order during all lunches! The cost is $10.00. See one of the officers during your lunch to order and/or pay. Support Ram Football as they play the Bruton Panthers TONIGHT at 7:00 at Wanner Stadium. This week’s theme is tropical – come dressed in your Hawaiian shirt and lei, and cheer on our football team! Student tickets will be on sale from 6:15 – 6:45 only. Get there early to get the discounted price of only $3.00! The Junior Classical League, AKA Latin Club, will meet this Friday during AEP in the auditorium. ALL current and former Latin students are welcome to attend. See Mrs. Feingold before school in room 628, across from band, for an AEP Pass. Do you have an interest in Law Enforcement or Criminal Justice? If so, the James City County Police Department’s Explorers Program is for you. Police Explorers is a non-paid, law enforcement organization whose main purpose is to give young adults a chance to begin training themselves for a career in criminal justice and law enforcement. If interested, see your School Resource Officer, Officer McLaughlin for further information. There will be a preseason workout for girls’ basketball tonight 7 – 8:30 pm in the gym. Workouts are open to all students regardless of grade level. Please bring the proper apparel for basketball, and be on time. Student athletes! If you are in need of peer tutoring through the IPAASS program, please see Coach Neve for a pass. He will have a form for you to fill out in order to join the program. See Coach Sorrell in room 111 if you have any questions. New Pep Club t-shirts are now on sale for pre-order during all lunches! The cost is $10.00. See one of the officers during your lunch to order/pay. Remember that THURSDAY night, Ram football goes up against the Bruton Panthers. This week’s theme is tropical. Come dressed in your Hawaiian shirt and leis, and be ready to cheer on our football team! Do you love reading? Join the library’s book club! The first book we will be reading is The Princess Bride. If you are interested, please sign up in the Media Center. 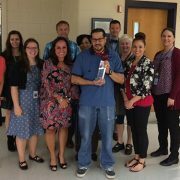 Lafayette High School would like to congratulate Walter Rios for being named Employee of the Month. Thank you Walter for your hard work and dedication to LHS!!! The Spanish Honor Society will have a short meeting today after school in room 302. See Mr. Bellido for information. Lit Mag will meet after school today in room 103. There is a Key Club Meeting scheduled for tomorrow in room 304 at 2:30 PM. We will be making dog toys as a community service for the Humane Society, and would like for everyone to bring in old t-shirts. T-shirts can be brought to 304 any time prior to the meeting. Come join the only in-school organization with the family as its central focus! FCCLA – Family, Career, and Community Leaders of America – is having its first meeting tomorrow, at 2:30 in room 417. Please see Mrs. Carter for more information. The Media Center will be closing at 2:30 this afternoon. The Love is Love Club will be meeting during AEP on Tuesday morning in room 302. Did you know that Americans used over 50 billion plastics bottles last year and only 23% were recycled? Does that worry you? Then please join the Lafayette Sustainability Club for its first meeting on Tuesday, September 26th, during AEP in room 315. See Mrs. Crowley for a pass. The Spanish Honor Society will have a short meeting on September 26th after school in room 302. See Mr. Bellido for information. There is a Key Club Meeting scheduled for Wed, September 27, in room 304 at 2:30 PM. We will be making dog toys as a community service for the Humane Society, and would like for everyone to bring in old t-shirts. T-shirts can be brought to 304 any time prior to the meeting. Come join the only in-school organization with the family as its central focus! FCCLA – Family, Career, and Community Leaders of America – is having its first meeting on Wednesday, September 27th, at 2:30 in room 417. Please see Mrs. Carter for more information. Do you enjoy art, photography, dancing, writing, creating short films, or composing music? Then the PTA Reflections contest is for you. This year’s theme is “Within Reach” and we are looking for original work that supports that theme. Deadline for entries is October 25th. Official rules and entry forms can be found in the front office. Seniors! ID cards are now available in the media center. Please pick them up at your convenience. Remember that all library materials must be returned, and fees paid, before getting your ID. Please remember that, in order to leave the cafeteria during lunch, you must have a pass to your destination. If you do not have a pass, you will not be allowed to leave the upper commons. Come out for MILITARY APPRECIATION NIGHT as your Lafayette Rams take on the Tigers of Tabb this evening at 7:00 at Wanner Stadium. All active duty military personnel will be admitted free with a military ID. Let’s show our support for the men and women that serve and protect our great country. Today is the final day to register for the College of William & Mary visit and the Hampden-Sydney College visit on Friday. Registration closes at 2:30 today. To sign up for a pass, go to the Lafayette website and follow the links. For all those interested in playing girls’ basketball: preseason workouts begin this evening, from 5:30 – 7pm, in the gym. Workouts are open to all students regardless of grade level. Please bring the proper apparel for basketball. 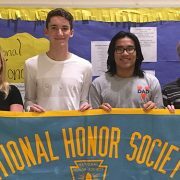 National Honor Society Members: please see Madame Collins during your lunch TODAY to complete a run-off vote for officers. She will be at a table in the upper commons. The first meeting for Operation Smile is TODAY, at 2:30 in the black box theatre, room 623. See Mrs. McCorry with any questions. The first meeting of the Gaming Club is TODAY at 2:30 in room 112. There is a $5 membership fee. Please see Mr. Downs for more information. DECA members: don’t forget that officer applications are due to Mrs. Napier in room 415 TODAY. For all those interested in playing girls’ basketball: preseason workouts begin tomorrow, Thursday, Sept 21st, from 5:30 – 7 pm in the gym. Workouts are open to all students regardless of grade level. Please bring the proper apparel for basketball.